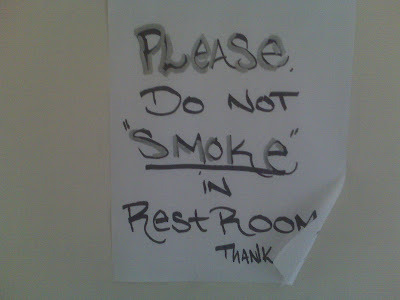 The “Blog” of “Unnecessary” Quotation Marks: no "smoking"
I don't know what all people were doing in the restroom and calling something that they already shouldn't be doing, but, um, stop that. Thanks, Kate. This is an admonition to the "Larry Craigs" of the world. "No cigarette afterward, bud." Or this is a directive to not be "hot" in the rest room. After all they are in there to rest, not to be stylin'. Or, Greg, it refer's to JimCarrey's old exclamation: "SmOkin'"